Uptime Racks MRCS13 can be configured as an 13,000 Btu air conditioned server rack. The open 4 post rack is compatible with all leading OEM equipment and, meets EIA 310-D standards for 19” rack mount equipment. The MRCS13 air conditioned server rack promotes easy access to IT equipment, and the vertical cable organizer optimizes efficient wiring and support for various power distribution units (PDUs). The MRCS13 delivers a curtain of cold air directly in front of the IT equipment, allowing servers to draw in the cold air into their intakes and exhaust warm air out the back. 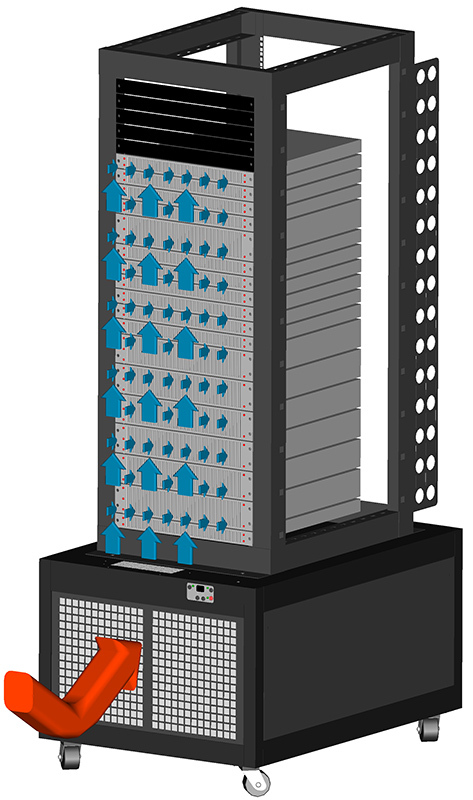 The front to back airflow pattern of Uptime Racks follows the American Society of Heating, Refrigerating and Air Conditioning Engineers (ASHRAE). The MRCS13 air conditioned server rack can be configured with a front air dam accessory that improves cooling efficiency to the level of a cabinet. By providing cold air directly in front of IT equipment and containing it inside the front air dam, this eliminates the mixture of cold and warm air. The MRCS13 air conditioned server rack fitted with the front air dam provides a highly efficient close-coupled cooling system, while supporting a racking system for easy access to the IT network.